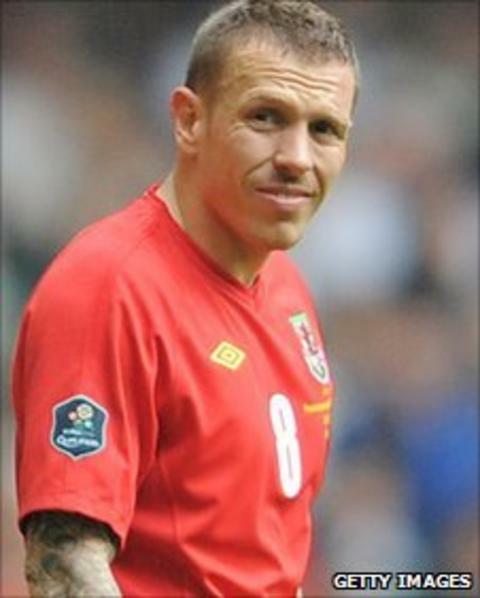 Wales manager Gary Speed is hopeful striker Craig Bellamy will continue his international career beyond the summer. The former captain welcomed Speed's arrival but has hinted at international retirement as he continues to manage his long-standing knee problem. Wales' new boss wants Bellamy for their Euro 2012 qualifiers against Montenegro and England in September. "Hopefully but you can't say 100% about anyone because you never know what will happen between now and then," he said. Bellamy handed back the Wales captaincy in January 2011 because he would be unable to play every game for Wales as he manages knee problems which led to nine operations, including knee reconstructions. The 31-year-old conceded after Wales lost 2-0 to England on March 26 that he would consider his international future after May's Nations Cup double-header with Scotland and Northern Ireland. Wales are bottom of Group G, having lost their opening four games, so their remaining four fixtures for Euro 2012 contention are academic, but Speed will use those games to build for the 2014 World Cup qualifying campaign. Bellamy insisted England "wasn't his last game" but did say "there are two games in the summer but I will have to look at where I'm going". He made his Wales debut aged 18 against Jamaica in March 1998 but his injury problems have restricted him to 61 caps, scoring 18 times, from a possible 108 internationals. And Speed is considerate of Wales' star striker. The Wales boss said: "I know Craig as well as anyone and if he's not feeling the top or feels he can't or doesn't want to go on, or feels if he does go on he won't be as good as he should be, then he'll finish. "All respect to him for that because he wants the best and wants to play the best and he wants the best from his career." The Manchester City striker, who is on loan at home-town club and Championship high-fliers Cardiff City, has a specially tailored training programme and should only play one match a week in an attempt to manage his problem and prolong his career. Bellamy, who replaced Ryan Giggs as Wales skipper in 2007, missed Speed's first Wales game against Republic of Ireland in February but played in the 2-0 Euro 2012 qualifying defeat to England in Cardiff. "Craig is a great influence on and off the pitch with the squad," added Speed. "And he showed in the last game what an influence he was in terms of talking to the players and making the players aware of what a great chance we've got of being successful." Aaron Ramsey replaced Bellamy as full-time Wales captain and became the country's youngest skipper when they faced England. But Speed has rejected claims he put too much responsibility on the 20-year-old Arsenal midfielder. "People might say that but I'm looking two years down the line when the next qualifying campaign starts," insisted Speed. "Aaron's going to have a lot more experience. "He's a fantastic player and was going to captain Wales sooner or later so if we can give him the responsibility now... then he will be better prepared in two years time like the rest of the team will be."